Looking for quick and healthy desserts or snacks on the go? 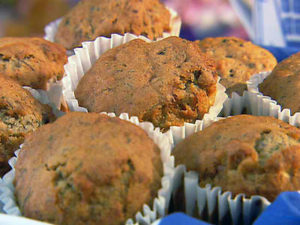 Try these very easy to make, fiber-rich and delicious Banana Raisin Muffins. Preheat oven to 375º F. Place paper liners into muffin pans. is moistened. Fold in raisins. brown. Remove from pan right away and coll on a rack. Makes 6-8 muffins. Store leftover Banana Raisin Muffins in an air-tight container.